Explore the unique shops that make up the charming Port Aransas shopping district! From local surf shops to upscale boutiques, there's something for every member of your family to enjoy. Golf Cart rentals are available for your stay. Please give them a call. 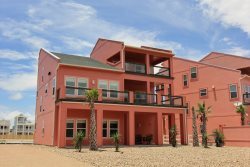 Offering everything from surfboards, body boards and kayaks to golf carts, and bikes, Island Surf Rentals should be your first choice for rentals in Port Aransas. A favorite shopping destination in Port Aransas, this is an affordable boutique offering name brand fashions and accessories for moms, daughters and friends.